Seat’s Toledo is almost cosmetically and mechanically identical to Seat’s Altea. 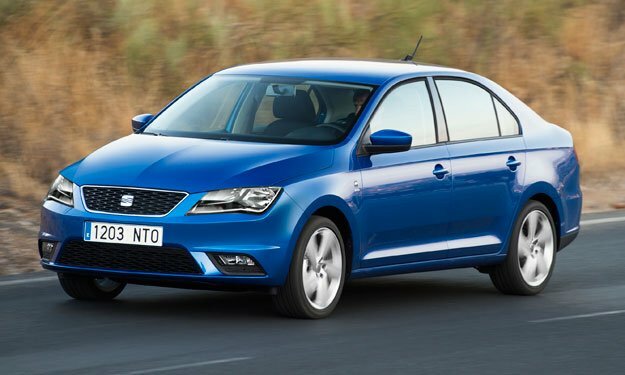 Seat has introduced the Toledo as a ‘saloon’ version of the Altea hatchback. The only problem with that line of thinking is that the Toledo is a htachback as well. According to Seat, the Toledo is a ‘notchback saloon’. The Toledo does look saloon-like. The fact remains that whatever description the company uses to describe the Toledo, when you raise the Toledo’s boot lid, the rear window comes with it. The Toledo is a hatch being passed off as a saloon. The Altea is an excellent vehicle, and the Toledo may prove to have a market with traditional saloon buyers. The UK loves a good hatchback, if it isn’t a second hand Skoda Roomster its a Ford Fiesta so they are likely to find a good use for the Toledo. The Toledo is a decent car it’s slightly longer and heavier than the Altea, but handles much the same way and features an identical interior. The car’s price will surely work against it because the Toledo is more expensive. Many saloon buyers will be reluctant to pay that kind of price for an actual hatchback. The Toledo is more expensive than the Altea, yet the cars are very similar. Seat’s prices have climbed as the company’s image has improved. Seat isn’t seen as the bargain brand that it used to be. to which it is so similar. Seat’s build quality has improved significantly with high levels of reliability. Running costs are low, and the Toledo loses its resale value much faster than the Altea. The Toledo offers 500 litres of bootspace. The Toledo also offers more cabin space than the Altea. The Toledo boasts a large glovebox with a chilling feature. The car boasts radio and satellite navigation controls. Seat has included alternative controls on stalks behind the steeringwheel. The controls could have been better placed for ease of use. The material used has a good quality feel. The Toledo provides plenty of comfort. The cabin is spacious enough to provide enough comfort for four adults. Driver and front passenger seats are both height adjustable. The steering wheel adjusts for both height and reach, and a fifth person can be accommodated with the touch of a button. Access to the car’s cabin is excellent. The car’s doors are tall and make access very easy. Access to the boot is also good. Most passengers shouldn’t have any problems accessing the car’s cabin. The Toledo can be very difficult to reverse park due to the car’s large back pillars. Even when fitted with parking sensors the car is difficult to reverse park and only experienced drivers should attempt it. The Toledo has a lot to offer drivers. The car’s raised drive position is similar to the feel of a medium-sized people carrier. The car provides a comfortable ride with good handling. The car’s acceleration is acceptable but not great. The Toledo would make a really decent family car. It offers high levels of comfort and boasts a good build quality. A family of four could use the Toledo as a primary vehicle. A larger family might find the car uncomfortable. This is not likely to be a very good first car. The limited rear visibility, and the car’s high price coupled with the fact that the car doesn’t deliver many qualities that new drivers find appealing will limit the number of cars that are sold to new drivers. Seat is seen as the sportier wing of the Volkswagen Group. The Toledo isn’t really sporty but it does seem well-made and modern. Seat’s quality continues to increase and sales continue to increase. The car comes equipped standard with remote central locking, deadlocks, and SE trim and above receive upgrades, such as a Thatcham Category One alarm. The Toledo shouldn’t be high on a car thieves list of priorities. The car includes reinforced sides and crumple zones to help protect passengers in the event of a crash. The Toledo feels solid and all seats have three-point belts. The car’s standard audio system includes a CD player and radio. The unit provides clear, sharp sound quality. SE and V5 models receive a six-CD autochanger. Sat-nav is available as a cost option. There are several metallic colours offered, and one flat color. Flat red is Seat’s trademark colour. The car’s cabin boasts quality carpeting and fabrics. The standard model includes air conditioning on models across the board. The Toledo is likely to be a rare sight in the UK. There is nothing special about this SEAT car and no reason to believe that buyers will choose it over more interesting and practically priced rivals.